It was billed as a chance to transform Greece's image abroad and boost growth, but 10 years after the country hosted the world's greatest sporting extravaganza there is little to celebrate at the birthplace of the modern Olympic Games. At the former Olympic rowing center in the town of Marathon, which gave its name to the endurance race, stray dogs play among overgrown weeds as a dozen youths train in the water. Across the city, the former canoe and kayak venue has dried up, and entire banks of spectators' seats have been ripped out. Just days before the anniversary of the August 13-29 Games in 2004, and as Brazil gears up for the 2016 Rio Olympics, many question how Greece, among the smallest countries to ever host the Games, has benefited from the multi-billion dollar event. "Celebrate for what?," said Eleni Goliou, who runs a grocery store in the capital. "They spent money they didn't have - our money, taxpayers' money - on a big party. You see any money left for a celebration?" she asked with a shrug. After failing in a bid to host the centennial Olympics in 1996, Greece, founder of the ancient and modern Olympics, was awarded the 2004 Games after defeating favorites Rome. However, once the initial euphoria faded, Athens wasted the first three years of its seven-year preparation period, only to be given a warning by the IOC in 2000 to drastically step up its organization efforts or risk losing the Games. 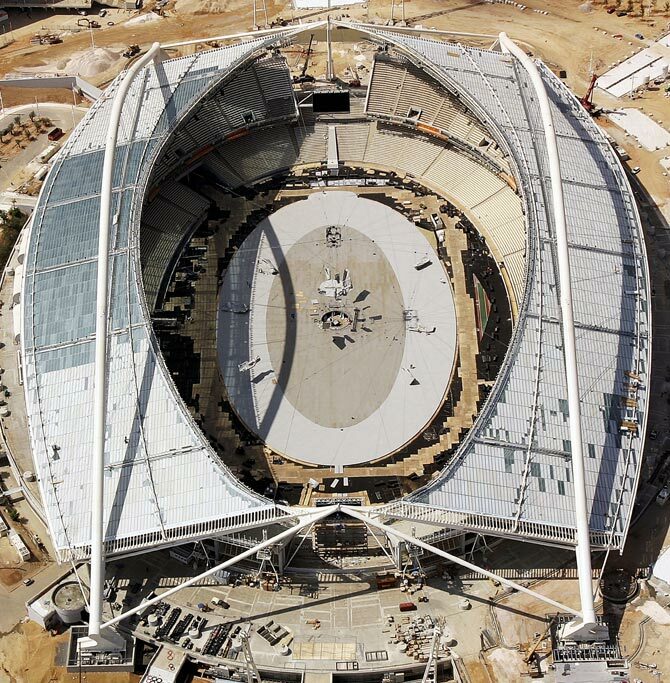 Image: An aerial view of the under-construction Olympic Stadium in Athens, on July 20, 2004. Banners proclaimed "Welcome Home" during the Games, which cost Greece an estimated $11 billion - double initial projections. "It was a waste of money and all for show. It cost a lot," said Dimitris Mardas, economics professor at the Aristotle University of Thessaloniki, who was the then-general secretary for trade. 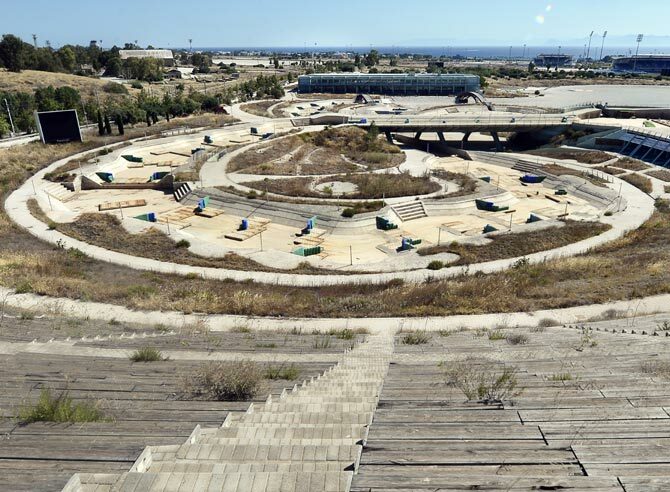 Unlike other host cities whose venues included prefabricated, collapsible structures, Athens opted for heavy buildings which "only served the interests of contractors," Mardas said. 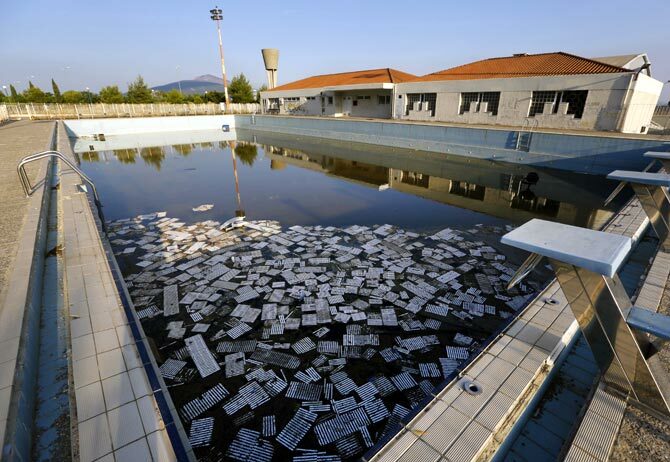 Greece's Public Properties Company (ETAD), which took over some of the Olympic venues in 2011, dismisses criticism that they are in poor condition, saying in a statement the facilities under its supervision "are being maintained by specialized teams... while the properties are guarded by security firms." Like Athens, Rio, which will host the Games for the first time on the South American continent, has come under fire for its slow progress, with preparations slammed as the "worst ever" by IOC vice-president John Coates in April. 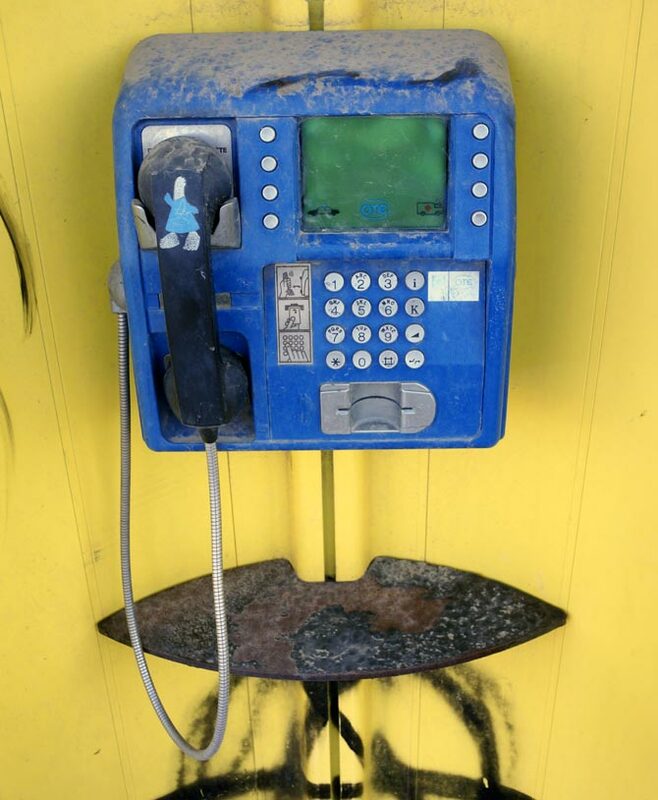 In an effort to reassure the world they can deliver the facilities on time, Brazilian authorities unveiled in the same month an infrastructure budget of 24.1 billion reais ($10.76 billion) for the Games, 25 percent more than planned. "For a city and nation to decide to host the Olympic Games is to take on one of the most financially risky type of mega project that exists," researchers Bent Flyvbjerg and Allison Stewart wrote. "Something that many cities and nations have learned to their peril." 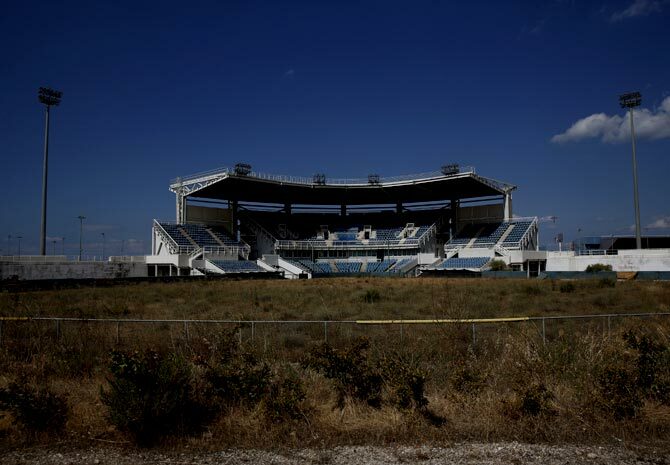 For supporters of the Games, Greece's failure is not in how much they cost or the state of the venues today. 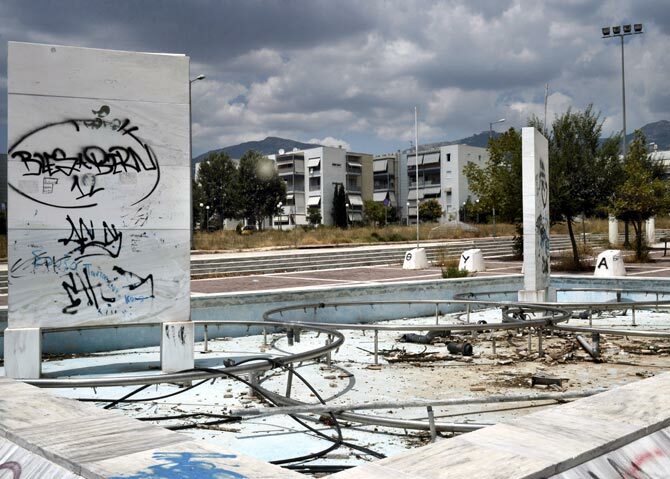 After all, not all are in dire condition - the Olympic Broadcast Centre is a bustling mall, the badminton venue is a theater and venues at the site of the former Athens airport have been sold. Rather, they complain that subsequent governments failed to capitalize on the Olympic legacy and use it to boost tourism in the country, its biggest industry. Just a year after the Olympics, hotels built for spectators closed down. "The (economic) crisis should have been the extra push, the pressure to capitalize on the Olympic legacy," said Stratos Safioleas, a spokesman during the 2004 Games and a consultant for Olympic bids and organizing committees since, including the winter Games in South Korea in 2018. "The Games were a lost opportunity, no doubt about it. But we still have Ancient Olympia, we still have Marathon. The question is, when are we going to stop missing opportunities?" 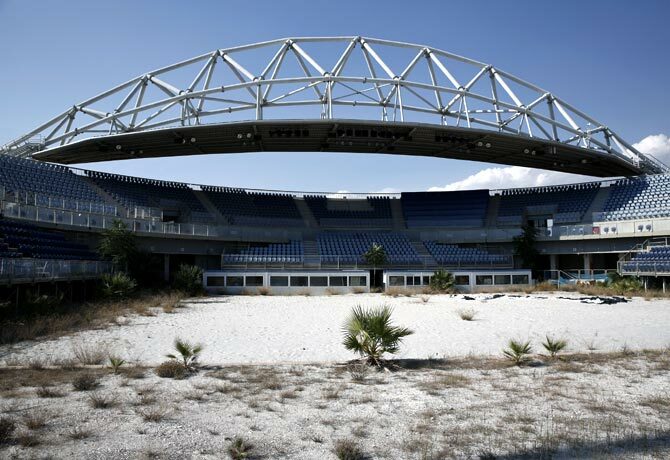 Greece's Hellenic Olympic Committee denies accusations that costs to host the Games contributed to Greece's debt crisis that exploded in 2009 and forced it to seek two bailouts worth 240 billion euros ($320.14 billion) from the EU and IMF. "They cost 8.5 billion euros. Was the 8 billion to blame when Greece owed 360 billion?" Hellenic Olympic Committee head Spyros Kapralos said. "If you put it on a scale, the positives outweigh the negatives but unfortunately we weren't able to communicate that," the former water polo player told Reuters. "The face of the city changed." PHOTOS: 10 BEST celebrations at Glasgow CWG!